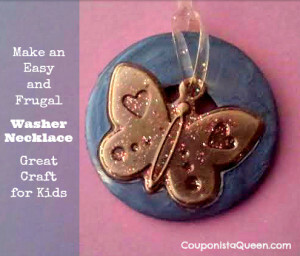 Frugal Fun: B’s Budget Boredom Busters! B is my daughter, I am Princess Thanya and well I work here at CQ headquaters for Stacy the Couponista Queen. B is usually asking what I’m doing when I’m fiddling around the computer but its summertime so I put the pc to the side a bit more to hang out with B and her older brother and do fun stuff together. We are going to visit family soon and B loves to give gifts. 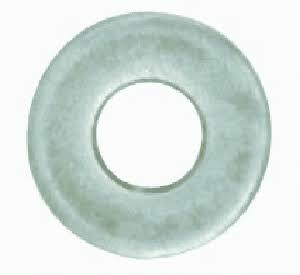 I was doing some research on google and found a bunch and bunch did I mention bunch of ideas about how to make washer necklaces. So I thought I have an 8 yr old that loves finger nail polish and glitter, lets do this! First, I’m not going to tell you to go to a craft store that defeats the ‘Frugal’ description. I can drop a pretty fine penny at those stores so I treat them as I do Macy’s. My husband is in construction so he had washers, boy did he ever! But if you don’t have any at home these run under 20 cents at Home Depot or Lowe’s where they sell them singly so you can choose the size etc. Next you need fingernail polish. Well that was easy, B went to her room and came out with a good assortment, plain and gliterized. If you coupon like I do you can score this on the cheap so again its ‘Frugal’. You can also use spray paint but we didn’t have any and I don’t like those fumes and then the subsequent need for air and oxygen (LOL). B had glitter and stuff from her stash of crafts so that was also something we already had and were not going to buy. Today I went to Walmart and I found some cute scrapbook supplies on clearance for 50 cents, they had these cute little cards with envelopes and the little metal charms so I spent a $1 and bought those for our project. B took over at that point with some supervision. I added top coat to the final product to protect and we had the clear plastic necklace string because we are crafty but you can use ribbon or string just whatever you have on hand (we have bought that at Walmart for under $3 and it has lasted forever and ever). 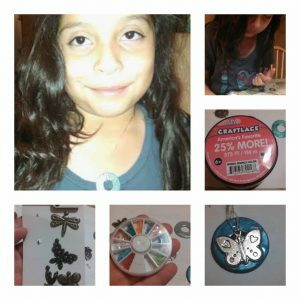 So for under $3 we have made some pretty cool necklaces that B will enjoy gifting and we spent time creating together. Stay tuned…soon B will give a tutorial on the string game!